The estate has been in the same family since time immemorial and has always been handed down by women. The current owner, Jean-Hubert Delon, inherited the estate from his paternal grandmother, Georgette Liquard. 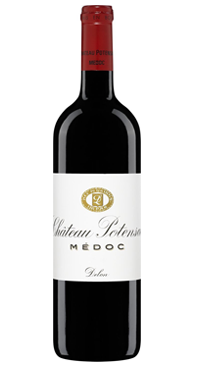 Although close to the river, Potensac is situated on a high point of land in North Medoc. Château Potensac’s vineyards extend mainly over hilly mounds with a limestone subsoil covered with clay and gravel outcrops containing a high proportion of gravel (“graves”). These limestone soils are very similar to those found in the Saint-Estèphe appellation. On this very special terroir, some plots of Cabernet Sauvignon and Cabernet Franc planted over 80 years ago still produce perfectly ripe, healthy grapes. The hamlet of Potensac was already cited in the first edition of Féret for the special characteristics and longevity of its wines. A classic blend of 50% Merlot, 30% Cabernet Sauvignon and 20% Cabernet Franc. This wine offers lots of red and dark fruit with notes of licorice and herbs. It is not too dense and has a nice amount of lift. Great value and drinking well now.